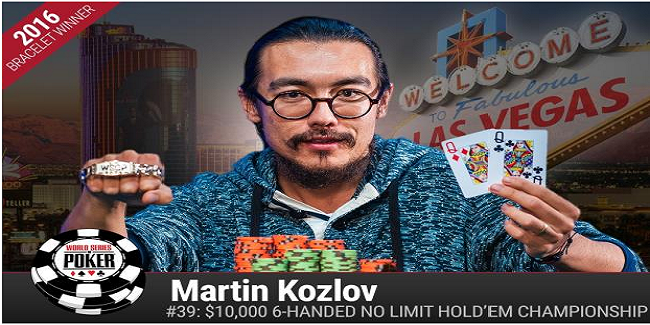 The event#39 of the prestigious world series of poker is goes to a professional poker player from Melbourne named Martin Kozlov, who took home the title of the championship and collected an amount of $665,709 as first prize. The game was for $10,000 Buy in six handed No Limit Hold’em, to which the Australian player did well at the end of the day and got his first ever gold bracelet at any WSOP. The tournament received 294 entries from different parts of the world and generated a cash prize pool of amount $2,763,600, top 45 players of the game were paid out. The final table included some of the best pro poker players of the world such as David kitai, Justin Bonomo, Chris Ferguson and Nick Petrangelo. Davidi Kitai was the runner up of the event and collected an amount of $411,441, being second. This was the 28th cash of WSOP for Kitai, the Belgium based poker player. Martin Kozlov has been through 7 final tables and cached out 14 times from World Series of poker. Lifetime earnings for the player, playing at different series are now $956,091. Best Previous WSOP Finish for the player was 4th back in 2014. Kozlov was a happy guy and told that “I love to play cash games, but in this tournament I also participated in a few tournaments”. This series is been good for me, I am sensing some special feeling right now, he added. Australian Martin Kozlov, becomes winner of the game and took home $665,709, whereas the second place of the match belongs to a pro from Belgium named David kitai for $411,441. Kitai was once having a very good chp lead but unable to beat the line against his opponent and got busted to second. The third position of the game was for Justin Bonomo, who took home $271,856 as cash prize. The player has 37 WSOP cashes and one gold bracelet in the year 2014 ($1,500 buy in six handed No Limit Hold’em) to his name. Fourth, fifth and sixth positions of the game were for Chris Ferguson, who got a winning share of amount $183,989, Nick Petrangelo, from Feeding Hills moved out to fifth for $127,622, whereas Jack Salter of London, United Kingdom becomes sixth and got $90,783 as winning share. The first elimination was of Eric Worre, from Eden Prairie, who collected $66,270, being seventh in the list.